Quote Reply Topic: A Sweepstakes Thank You! If you’ve paid any attention to our Rentacomputer.com marketing efforts, and if you haven’t.. I won’t blame you, you might have noticed we run a sweepstakes every quarter. We’re now in the midst of our ninth Rentacomputer.com sweepstakes and we’re giving away a Waterproof Sony Cyber-shot, so check that out and enter! Our last sweepstakes however, dubbed the “Eggcredible Gadget Giveaway“, was perhaps from start to finish our funnest sweepstakes yet! From sitting around coming up with that title, and let me tell you, nothing that ridiculous comes easy, to our list of 10 must have tech items that could all fit inside gigantic plastic eggs… it was fun! But this post isn’t really about that. It is, however, about saying thanks to one of the nicest, most grateful, Rentacomputer.com sweepstakes winners we have yet had the pleasure to work with. That would be Barb Facci of Cleveland, Ohio. 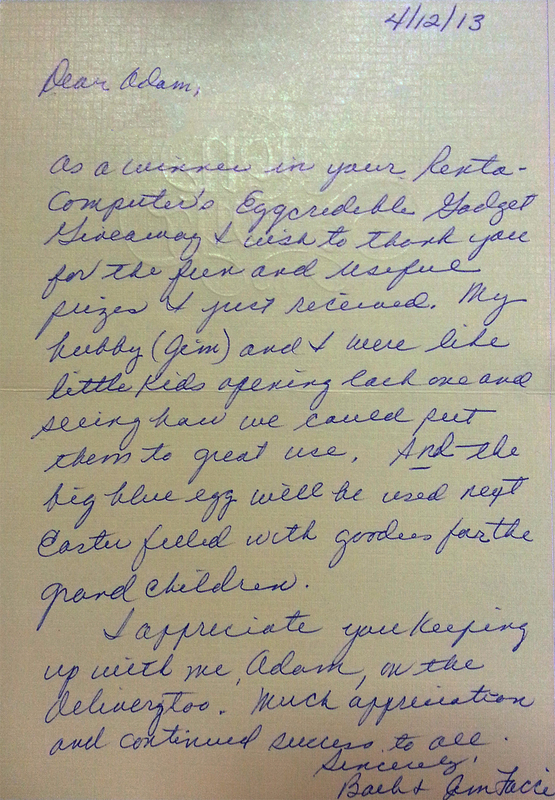 Not only was Barb thrilled with winning, she said so on the phone, in e-mail, and in this very nice handwritten letter we received after Barb received her Eggcredible prizes.